In support of the exhibition Rodin: The Human Experience, Rodin Remix is a hands-on space that encourages visitors to explore and create figures based on the artists’ own process of reusing old fragments in new works. It also puts a modern spin on Rodin’s method of mass production by showcasing pieces printed on 3D printers. Rodin recycled cast offs, fragments of plaster casts that had already been made, by recombining them into new sculptures. For example, Rodin knew that a different pair of legs would change a sculpture’s expression. 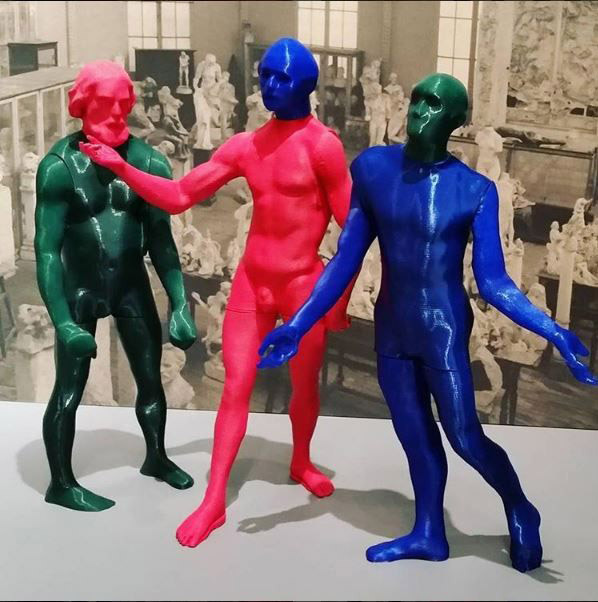 In Rodin Remix visitors can create their own dramatic sculptures from 3D printed and magnetized Rodin figures, to get a taste of the artist’s use of fragments. We partnered with the Portland 3D Printing Lab to produce 3D prints, which are made by extruding molten plastic into thin layers. As the layers add up, they build a 3D form. Prints were made from free online STL files under the Creative Commons license, and from scans of the Rodins in the show. Those files can now be found on the exhibition page. Rodin would sculpt a model in clay, then pass it to his assistants. They rendered the work again in marble or bronze, sizing it up or down according to Rodin’s and his patron’s wishes. Rodin’s assistants made hundreds of casts of the same model, all official Rodins, in a sort of artistic mass-production. Smaller bronzes, produced in large quantities, were more affordable. These relatively inexpensive bronzes widened the range of people who could purchase a Rodin, earning the sculptor more money and popularity. Just as Rodin mass-produced bronze casts of the same sculpture in multiple sizes and media, the Portland 3D Printing Lab made many 3D prints of Rodin sculptures, experimenting with size and color. 3D printing can easily mass-produce objects, echoing Rodin’s earlier mass-production. The Portland 3D Printing Lab created numerous prints of Fallen Caryatid with Stone in Rodin Remix, to juxtapose the expressive qualities of the same sculpture when it is 6” high and bright orange instead of 10” high and black. All of the 3D prints in Rodin Remix provide a tactile experience of Rodin’s forms, one you would not be able to have with the bronzes. Visitors are also encouraged to Instagram a photo of their creation in front of a backdrop of Rodin’s studio, which shows the plaster fragments he used. Each Monday during the run of the show, a visitor’s photograph appears on the @portlandartmuseum Instagram, with the tag #rodinremix. Come to the museum to experience Rodin’s art in a new way, build a sculpture, and Instagram your creation!